Yemen’s population is the largest of the Arabian Peninsula and has been a primary source of the Arab diaspora since ancient times. Peoples in North Africa and as far away as Indonesia trace their ancestry back to Yemen. Tribal influences remain very strong in Yemen, resulting in a complicated political system. 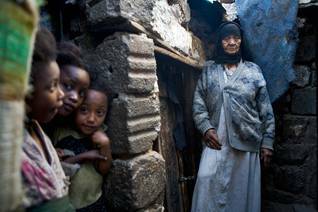 The so-called Akhdam – descendants of immigrants of African origin – form a neglected Yemeni underclass. 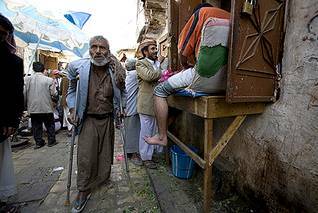 Yemen’s population density is 40 per square kilometre. This is twice the population density of Brazil, half of that of Turkey, roughly the same as that of Iran, and slightly higher than that of the United States. A large part of Yemen is virtually uninhabitable, consisting of desert or steeply mountainous terrain, so Yemen gives the impression of a populous and busy country. Yemeni men spend most of their lives outdoors, in each other’s company, and less in the privacy of their own homes. This further strengthens Yemen’s lively image. Women are also increasingly present in public spaces. Yemen’s population is very young and growing fast. The annual growth rate has dropped from 4.6 percent in the 1990s to 2.7 percent in 2010, but, on a global scale, it is still high. In 2010, the median age was 17.8, up from 14.3 in the 1990s; more than half the Yemeni population was born during the last twenty years. 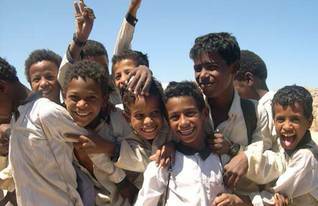 Officially, Yemen counted just over 24.3 million inhabitants in 2010. This may, however, be a conservative estimate. Projected population numbers hover around the alarming figure of 30 million in 2015 and a peak of 40 million in 2025. The growth of the urban population has been slow in Yemen, but it has accelerated, from a low of 14.8 percent in 1975, to 27.3 percent in 2005, and 31.8 percent in 2010. 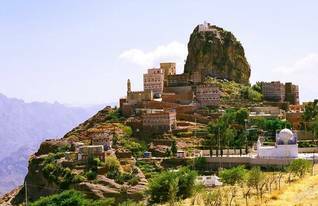 Yemen’s population is concentrated in the western part of the country, where a range of impressive mountains (the Sarawat mountains) rises from, but does not lie immediately along, the Red Sea. The width of the mountain range ranges from 100 to 200 kilometres. In length, it stretches across all of (western) Yemen, extending well into the southern Saudi provinces of Jizan and Asir. The mountains are high: Jabal al-Nabi Shuayb, at 3,666 metres, is the highest in the Arabian Peninsula. It has alpine vegetation (and a military base) on its summit. On average, the mountains are about 2,000 metres high, making the range a substantial barrier to humid air blowing in from Africa and the Red Sea. As a result, there is sufficient rain to feed a large population. The fertile mountains around the southern town of Ibb are green all year round. Rain-fed agriculture abounds in the mountains, which are adorned with ancient terraces, some laboriously maintained, others neglected. The largest towns are found along the spine of the mountain range, with the capital, Sanaa, in the middle and the third largest town, Taizz, in the south. There are also many medium-sized towns between them and in their vicinities. The mountains in the north are significantly more arid and consequently much more thinly populated. As few as 25,000 inhabitants live in Saada, the northernmost town of Yemen, which was, like Taizz, once the capital. Beyond the southern end of the mountain range lies hot and humid Aden. Over the centuries, its strategic position and natural port have stimulated its growth, making Aden the second largest city in Yemen. The Yemeni population is very homogeneous. Nearly all Yemenis are believed to be ethnically of southern Arab origin and are traditionally considered descendants of Qahtan (although through the centuries they mixed with Persians, Indians, and others). Southern Arabs are considered – in local genealogical tradition – to be ‘purer’ Arabs. 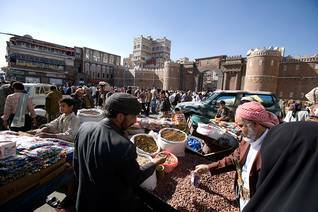 Many Arabs regard Yemen as their (sometimes distant) land of origin. There is also a small minority of (Shiite) Ismailis. There used to be many Jews, but the present Jewish community numbers only a few hundred. The qabila, or tribe, is of major importance in Yemen. Tribes adhere to Sunni (Shafii) Islam or Shiite (Zaidi) Islam. All Yemenis – with the exception of new immigrants and the Akhdam (Yemen studies mention several other terms for these non-tribal people, including duafa, masakin, and mustadafin, meaning weak, poor, and vulnerable people) – are tribal, in varying degrees; southern Yemenis are much less so than northerners. City inhabitants also call themselves tribal, for the qabail (the plural of qabila) are a source of both historical pride and present-day identity. People sometimes find it helpful to refer to their tribe in order to get elected, to be protected, to find a job, or even to get permission to build a house. The tribes therefore dominate Yemeni politics. Legend has it that Yemen was founded by Qahtan, the father of the southern Arabs. Qahtan is said to be the father of Yemen and the forefather of Saba, eponym of the kingdom of Saba (Sheba). Saba had two sons, Himyar and Kahlan. After the fall of the kingdom of Saba, the tribes spread from the Marib plateau to settle in the western mountains. Yemeni tribes are not nomadic but are sedentary communities of people bound to their agricultural territory. Tribalism has diminished in the southern mountains, where conditions are less harsh than in the north. 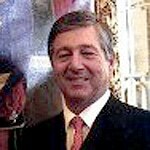 The south has often been ruled by outsiders, in modern times by the British Empire. Because farming opportunities in the north were far less favourable, northerners have, in the past, often migrated to the south or beyond the Peninsula. Although these migrants retained the memory of their ancestry, many of their tribal practices were lost in the migration. Some North African Berbers believe they are directly descended from the Yemenis. Many Saharan tribes claim descent from the Banu Sulaym, who originated from Yemen and Saudi Arabia. The Lamtuna, a Berber nomadic tribe of the western Sahara, claims descent from the old South Arabian kingdom of Himyar. Islamic Seville (called Ishbiliya) was governed by Yemeni Arabs descended from the Banu Lakhm. The Zaidi imams ruled northern Yemen from 873 until 1962, after local tribes invited the first Zaidi imam to come and settle tribal disputes. The Zaidi imam heads a Shia sect, referred to as ‘Fivers’, followers of Imam Zayd. They briefly established states in northern Iran, but their stronghold was in Yemen. From the 9th century onwards, the Zaidi imams were a constant factor in Yemeni politics, at times extending their rule as far as Taizz. The Zaidi imams, who were theocrats rather than military leaders, never fully controlled the northern Yemeni tribes. During the eleven centuries of their rule –during which they moved the capital back and forth from Saada to Sanaa and on to Taizz – tribal revolts broke out frequently across the country. In the south and in distant Hadramawt, smaller dynasties, tribes, and sheikhs contested Zaidi rulership. In the 19th century, the Ottomans returned briefly to power, but they too failed to rule the entire country. In the north, Zaidi tribes easily held out against the Ottomans, while the Crown Colony of Aden and its protectorates, in southern Yemen, had, since 1839, been in the hands of Great Britain. The British controlled Aden and its immediate surroundings in order to secure strategically located Perim island in the Bab al-Mandab – the entrance to the Red Sea –and with it the important sea route to Asia. Aden also possessed a natural port, where long-haul ships could refuel. British rule did not extend much beyond Aden, where they entered into an alliance with local sheikhs, called Ingram’s Peace. The Ottoman Empire perished after its defeat in World War I. Yemen was then already governed by a Zaidi imam, Yahya, with the exception of the Crown Colony of Aden, which was controlled by the British. He and his successors ruled the country under the name of the internationally recognized Mutawakkilite Kingdom of Yemen. In 1934, Yemen lost the northern province of Asir to Saudi Arabia. Imam Yahya and his son and successor Imam Ahmad cut off Yemen from external influence for nearly fifty years. By abducting tribal sons as a short-term means of enforcing obedience, Imam Yahya alienated the tribes on whom his military rule was based. There were several revolts, but the imams always prevailed. In 1962, however, a republican revolt – aided by the Egyptian army and aggrieved tribes – drove out the fourth imam, al-Badr, to Saudi Arabia. Imam al-Badr died in 1996 in Great Britain, to which he had emigrated on Saudi Arabia’s official recognition of the Yemen Arab Republic (YAR; commonly referred to as North Yemen before unification) in 1972. 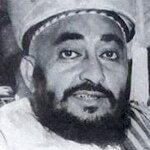 His eldest son, Ageel bin Muhammad al-Badr, who bears the title ‘King (Malik) of Yemen’, lives in exile in London. 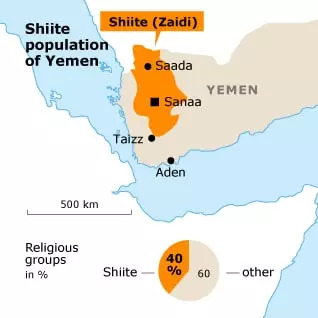 The Zaidi sect of Shiite Islam has long dominated Yemeni politics. Zaidism is a branch of mainstream Shiism that arose from a dispute over leadership concerning the fifth imam, in 740 CE. Zaidis are followers of Imam Zayd, whom they judged a more just leader than his brother Muhammad al-Baqir (the fifth imam of the Shiite mainstream ‘Twelvers’, who follow twelve imams, beginning with Imam Ali, the fourth ‘rightly guided’ caliph). 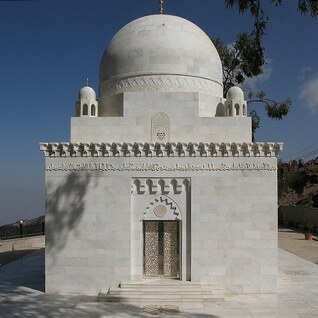 Zaidis are therefore also referred to as ‘Fivers’ (while Ismailis are called ‘Seveners’, from a dispute over the succession of the sixth imam). Compared to mainstream Twelver Shiism, Zaidi Islam is considered moderate. Its doctrine is similar to that of Shafii Sunnism. Theological disputes between Zaidis and Shafiis have seldom led to conflict. The state religion of Yemen is Islam. Mainstream Islam – Sunnism – has predominated in the south and east since the advent of Islam, in the 7th century. Yemeni Sunnism follows the Shafii school of religious law, which is the second largest of the four existing schools of Sunni law. Throughout history, there has been little religious conflict between Shafii and Shiite Yemenis; in general, Yemenis are rather tolerant. Since the 1970s, Saudi influence has been growing. Many Yemenis have worked in Saudi Arabia, some of them adopting puritanical Wahhabism, or Salafism, the predominant legal school of Sunnism there. Saudi Arabia has financed a large number of Wahhabi schools – called formally ‘scientific centres’ – in Yemen, where young people are educated according to Wahhabi beliefs. Wahhabi Salafism is not tolerant of Shiite Islam, denouncing it as a religion of kafirs (unbelievers). A growing number of Yemenis now follow Wahhabi Islam. The movement is strong and appealing, as its followers are offered access to schooling, medical services, and business opportunities. 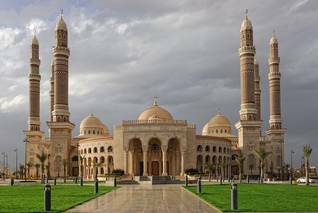 Throughout Yemen, mosques are being converted to Wahhabism by the appointment of Wahhabi imams. If a tribal sheikh ‘converts’ to Wahhabism, the whole tribe is converted along with him. The Sunni proportion of the Yemeni population is consequently believed to have increased from half to more than three-quarters. The Ismaili branch of Shiite Islam arrived in Yemen with the Fatimid Empire, which ruled from Egypt from the 8th until the 10th century. Ismailis (sometimes referred to as ‘Seveners’) originally differed from mainstream Shiism on the topic of the succession to the sixth imam. However, they have since drifted towards a more liberal religious position, branching off into a number of sects. Ismaili Islam has tended to spread eastwards, to India and parts of Iran, but enclaves can be found also in countries such as Turkey, Syria, and Yemen. Only 1-2 percent of Yemenis consider themselves Ismaili (Yemeni Ismailis call themselves Tayyibis). They are also known as al-Bohra (from a Gujarati word meaning ‘traders’; it is the designation for converts to Ismaili Islam outside Yemen). Al-Bohra are renowned merchants, who have their own market in the vicinity of Bab al-Yaman, the open-air market in Sanaa’s Old City. Jewish children at school Photo HH[/caption]Judaism came to Yemen when Jews migrated from the region of Jerusalem after the last Jewish kingdom in Palestine was defeated by the Romans, in the first century CE. In fact, in pre-Islamic times, Judaism (sometimes with Christianity) dominated significant parts of Yemen, as local rulers converted. 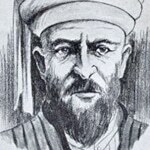 The most famous Jewish ruler was Yusuf Dhu Nuwas, a Himyari king who ruled from Zafar in the 6th century. Dhu Nuwas reportedly persecuted Christians in reaction to the persecution of Jews by the Byzantine emperor in the northern Middle East. The rule of Dhu Nuwas was ended by a large force of Christian Ethiopians. Judaism and Jews remained in Yemen. After the arrival of Islam, Jews, who were, like Christians, ‘People of the Book’ – ahl al-kitab; Jews, Christians, and Muslims share many of the revelations of the Old Testament – were granted the status of dhimmis and were protected by Muslim rulers, although they did not enjoy full civil rights: Jews were not allowed to ride horses, wear colourful clothes, or build houses that were taller than Muslim buildings. Instead, they built cellars in which they could store, among other things, their wine, which they were allowed to drink. Orphaned Jews were often converted to Islam. In the 19th century, Jews were given the degrading task of cleaning public baths, toilets, and sewers. At the beginning of the 20th century, there were some 80,000 Jews in Yemen, spread over 1,050 communities, predominantly in Zaidi areas. As many professions were forbidden to them, Jews in Yemen made a living as artisans and craftsmen: jewellers, weavers, silversmiths, shoemakers. This made first-class Muslim citizens very dependent on second-class Jewish citizens. By the end of the 19th century, Jewish migration (Hebrew, aliyah) to Palestine began. At first, only a few families left, but when the State of Israel was founded, the interest of Yemeni Jews grew. In 1950, with the consent of the Yemeni imam, the government of Israel mounted Operation Magic Carpet, airlifting (by British and American planes) between 35,000 and 50,000 Jews from Aden to Israel. Many Yemeni Jews saw this as the fulfilment of God’s promise to end their suffering and diaspora, but they have found their reception in modern, secular Israel disappointing. There was little demand for their knowledge and skills, so Yemeni Jews became members of Israel’s lower social classes, along with black Ethiopian Jews. The Yemeni Jewish migration has continued throughout the years. The remaining Jewish population lived largely in the north, but, as a result of the Houthi war, these last Jews were expelled from the city of Saada and its surroundings. In 2008, after a violent incident in Rayda in which a rabbi was shot in cold blood and his killer escaped prison, the majority of the large Jewish community in Rayda also left for Sanaa. From there, some went on to the United States or Israel. There is virtually no immigration into Yemen. Exceptions are the small expatriate communities in Sanaa and Aden and a growing group of Somali refugees who have crossed the Red Sea during the last decade in small boats owned by human traffickers, fleeing the dire conditions in southern Somalia. From 2006 onwards the number of boat refugees to Yemen has held at about 50,000 per year. The Somali refugees live in large refugee camps near Aden and Bir Ali, which are supported by the UNHCR, and on the outskirts of large cities, especially Sanaa and Aden. Most refugees try to continue their voyage to Saudi Arabia, one of the Gulf countries, or Europe, while some return to Somalia. Many remain in Yemen. In 2010, their number exceeded 200,000, as the influx and natural growth of the population continued. Another exception to the rule of limited immigration is the Akhdam (literally, ‘servants’), descendants of immigrants of African origin. The Akhdam are believed to be the offspring of Christian Ethiopian warriors who invaded southern Arabia in the 6th century but who were later defeated and forced to serve the Yemeni Arab population. Some studies indicate that the Akhdam may also include indigenous Yemenis from the Tihama and more recent immigrants from the African side of the Red Sea. The Akhdam, who prefer to be called muhammashin (literally, ‘marginalized ones’) number between 250,000 and 500,000, although estimates by Akhdam activists are much higher, up to three million. In practice, the Akhdam lack many civil rights, including the right to own land, to obtain building permits, or to hold passports. The Akhdam are not entitled to social services, and foreign aid generally passes them by. The Akhdam do not intermarry with Yemeni Arabs, and the Akhdam still perform the most menial jobs in Yemen. Akhdam can be seen everywhere in Yemen, dressed in orange overalls, sweeping the streets. There are hardly any dustbins on the streets of Yemen, so there is always plenty of rubbish to be collected. Every building block in Sanaa has its own Akhdam to collect the refuse and sweep the streets. According to the local managing director of Sanaa’s waste-collection service, the Akhdam in official jobs are nowadays paid reasonable wages. Although most Yemenis are of tribal origin, there are some distinctions in social class. There is a small upper class of Zaidi Ashraf (singular sharif) sayyids. These are all Hashemites, descendants of the Prophet Muhammad. They are considered wise and learned men and are traditionally consulted in important matters. However, the power and influence of this group is diminishing somewhat as a result of the Zaidi guerrilla war in the North. There is also a small upper class of qadis, or religious judges. Most Yemenis – al-shab (the people) – are tribal. Traditional tribal people may commute to towns and cities during business hours or for longer periods but remain attached and faithful to their territorial power base in tribal areas. Urban tribal people are slowly changing into a large middle class with tribal roots. Urban tribal people are dominant in the south, where some families have become oligarchies rather than tribal groups. At the bottom of the social pyramid are two groups, the Akhdam and the Mazaina. The Akhdam – of African descent and appearance – form an underclass who spend their days sweeping the streets and working as cleaners throughout Yemen. The number of Akhdam is estimated at between 0.5 and 3 million. 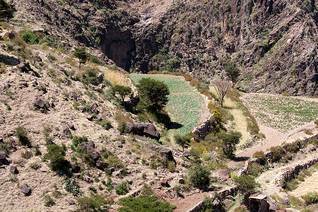 The Mazaina are a lesser known small group of tribal Yemenis, numbering perhaps 250,000 to a half-million. Mazaina perform service duties for fellow tribal-village men and earn their livings as hairdressers, butchers, and attendants in the hammams. Although the status of Mazaina is much higher than that of Akhdam, both groups can be categorized as lower castes. Escape from their social position, through intermarriage with other groups or otherwise, is nearly impossible.